Chase Evil From Your Home. Remove Evil Influence! Overcome Evil, Drugs, Jinx. Run Devil Run! Drive Away Evil. SONNY BOY® Drive Away Evil! Drive Away Evil Influence! Drive Away Harm! Relatives, Neighbors. Use DRIVE AWAY EVIL Kit every week. Keep a cross over your door which is anointed with oil. Write the names of your family on parchment paper, dress with oil. Wrap in a white cloth which is anointed with Holy Water, and wipe every window and door with the cloth, also wipe your telephone and mailbox. Sprinkle Angel Sand under each bed in your home. Sonny Boy says always use a kit for strongest action. SONNY BOY® Cast Off Evil! Remove bad habits and influence! Burn a Peaceful Home Candle and a Cast Off Evil Candle. When your family or home is threatened by evil or trouble, wipe a $1 bill, or a paper the size of a $1 bill, with anointed cloth. Then fold the bill and put it in the church offering, or keep it in your Bible. Pray over the paper daily. Anoint your home. Or if you are in a hurry, give the $1 bill to a church member. When someone is influencing your home and trying to break it up, or causing trouble, make a circle on a white cloth to represent your home. Put it under a white candle, don't move the cloth for any reason for 30 days. Then use as a prayer cloth. Sonny Boy says always use a kit for strongest action. SONNY BOY® Stop Evil! Stop Drugs! Drinking! Abuse! Overcome! Run Devil Run! Dual Action 1 - Write the name of the offender on parchment paper, and burn in incense daily. Fan the smoke out a window. 2 - Write the name of the offender on parchment paper. Put in a bottle of oil, add some Angel Sand. 3 - DAILY - Drop a drop of oil on their clothing or shoes or something that belongs to them, or that they have touched, where they will not know it is there. This is good for any evil interference or threat that you encounter. Sonny Boy says always use a kit for strongest action. SONNY BOY® Run Devil Run! Evil takes many forms in order to infiltrate your life. You can feel the effects: Pain, Poverty, Despair. 1 - Hang a white cloth which is anointed with oil inside and outside your door. If you know the evil one causing the trouble, write their name on the cloth. Anoint with oil on all 4 corners, or you can write, "evil". 2 - DAILY - shake the cloth outside your door in the 4 directions North, East, South, West. 3 - Pray, "Deliver us from Evil" 3 times after sunset. Use RUN DEVIL RUN KIT after sunset daily. Sonny Boy says always use a kit for strongest action. SONNY BOY® Psychic Vision Power! Unlock Your Psychic - Get the Advantage in Any Situation - See the Truth - Know Your Enemies. Use Psychic Vision Regularly - Always Have An Upper Hand. 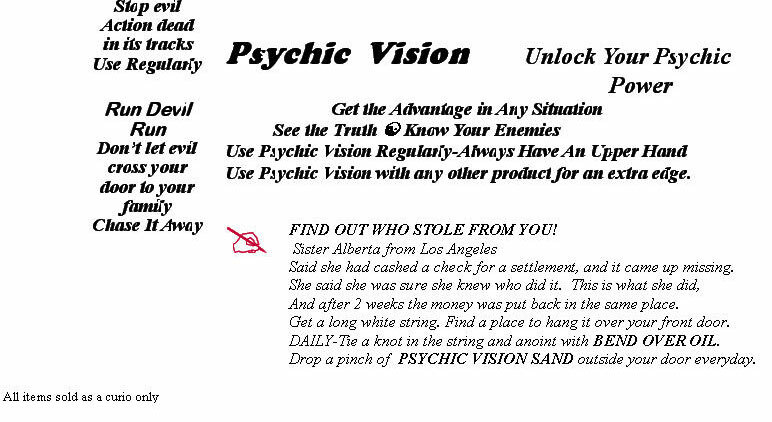 Use Psychic Vision with any other product for an extra edge. You will come to rely on Psychic Vision when you are dealing with any kind of interference from Relatives, Friends, Co-Workers. You can always make better judgment when you know the truth. FIND OUT WHO STOLE FROM YOU! Sister Alberta from Los Angeles wrote us: said she had cashed a check for a settlement, and it came up missing. She said she was sure she knew who did it. This is what she did, and after 2 weeks the money was put back in the same place. Get a long white string. Find a place to hang it over your front door. DAILY - Tie a knot in the string and anoint with BEND OVER OIL. Drop a pinch of PSYCHIC VISION SAND outside your door everyday. Sonny Boy says always use a kit for strongest action. "I am 84 years old and I have to raise my grandchildren. I sometimes have to get them out of jail and get them out of all kinds of trouble with drugs and evil. I use Run Devil Run with Peaceful Home, and the Lord takes care of us. Sonny Boy is a blessing." From a letter from M. Dubois, New Orleans. Sonny Boy is the #1 supplier of spiritual products and botanica. Strong! Dependable! Sonny Boy spiritual product's ancient recipes for incense and oils are the most powerful. Burn Sonny Boy Novena Alter Candles allow your prayers to communicate your need for God's blessings. Drive Away Evil, Protect From Evil and Harm, Run Devil Run products are triple strength to keep evil from you and your family. Evil can effect our lives at home, at work, or in our every day lives. Prayer and Faith will deliver us from evil. Call on Sonny Boy Triple Strength Spiritual Products to keep the powers of evil from ruining your life. Burn Sonny Boy Novena Candles, use the incense and oils and other items in the kits. You will draw the blessings you need.